As We Play offers the thought strands of the reviewer as they’re going through the game. This offers unique content for the reader so they can come to understand the conflicting feelings of the reviewer as they’re playing a game for the very first time. All feedback on this concept is welcome. If there’s one thing a game has yet to do on Xbox One, it’s test the true quality of new-gen Kinect against the old. 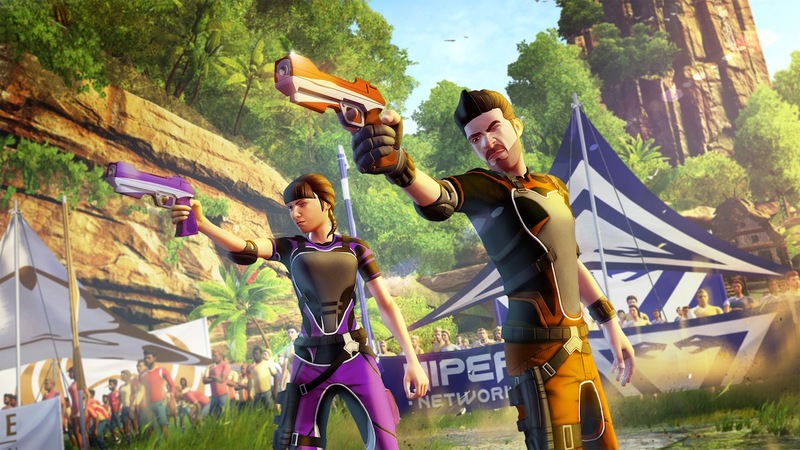 There’s no denying all eyes are on Kinect Sports Rivals to be that game and right off the bat, we get a feel for Rare’s efforts to illustrate that change. The game throws you right into the story. It appears that, in order to access all game-types, you’ll need to wade through the story and train up in each of the game-types in order to get to grips with the game then best a fierce clan who is totally, ultra skilled in that game-type. Fair enough. First up is Wake Race (not to be confused with Wave Race) and the good news is it’s really responsive and accurate. You can even sit down and play. That suits me fine! 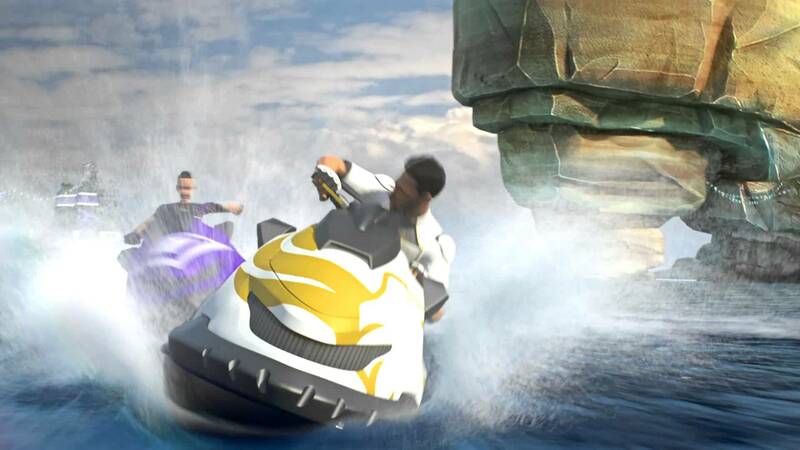 Put out both arms and steer your Wave Racer, clenching your hand so as to speed up or easing off to slow down. You also need to tilt back and forth when going up ramps in order to pull off stunts and if you want to use a power up, you can either shout at Kinect to activate a speed boost or press your foot down on the ground to activate it. It concerns and excites me just how responsive this is. The game works perfectly, and I wonder whether Rare put their best work out first or if this really is a taster for the goodness to come. Once mastered, I went head to head with a rival clan and had to finish in a certain position in order to progress. Depending on how you place, you’ll earn experience which can be spent on upgrading your vehicles and character’s look. As it turned out, I came first on my first try and racked up quite nicely on the score-sheet. I even treated myself to a little outfit. Frankly, Kinect has been touch-perfect so far. Even navigating menus with a hover and push has been wonderfully responsive. So it’s a shame that taking part in climbing is a serious momentum-killer. To put it bluntly, the climbing is awful. For a start, you’ll need to completely re-arrange your room. The Kinect sensor needs full vantage of your entire body, so bare that in mind before you start playing. It’s probably best to be a considerable distance away, but if you’re at least medium-sized in height, at full arm-stretch, Kinect won’t be able to register what you’re doing. Its range doesn’t go that far. And the aim of the game is to reach high in order to scale a rock-face. The game even tells you to do that. I push back, hoping things will improve, but then I went out of Kinect’s field of vision. I had to re-arrange my room four times in order to find the sweet spot and at least get the sensor to pick me up half-coherantly. I was not impressed. In order to play, you’ll have to be at the precise angle in front of Kinect, but even then the game isn’t entirely responsive. Also with your arms constantly upright, it all becomes pretty exhausting. Climbing definitely feels like it could have been omitted. It’s asking slightly too much of Kinect and the player. You need a really specific room-set to play and that will not work for the majority. That said, when you figure out that the best way to win is basically ‘keep jumping’ and you have a run with a bit of luck, you can get up the wall quite quickly. Just watch your stamina and you’ll be at the finish line in no time. Thing is, you don’t keep jumping when actually climbing a rock-face. There’s actually a bit of reaching and pulling required, which this doesn’t seem to capture very well. All in all, not really an accurate portrayal of the sport. But hey, what does that matter? The story mode really shows off Rare’s quirky, zany style. It has been a while since they’ve really let loose and gone back to their roots, but this game definitely likes creating characters and showing off a fun side more than any of their recent games post-Viva Pinata. So that’s something. Shooting is up next. This is a more relaxed game-type following the first two and it works half decently, really showing off how good Kinect can be at picking up finger gestures. The idea is to create a gun with your hand, point it at the screen and use a ‘trigger finger’ to fire bullets at targets. The targets appear on a large grid and vary where they position on screen; some move, some are stationary. Opposite you is your opponent who is also shooting at targets. The cool thing? You can actually shoot some of their targets, giving yourself more points and forcing them to lose some of theirs. It’s all entertaining enough for a few minutes fun, but Kinect sometimes struggles to pick up your arm movement, as opposed to your hand-gestures, which presents some frustrations of its own. Most of the time, the game catches it, but it’s almost as if Kinect is spending all of its resources trying to pick up finger motions that it becomes oblivious to your arm movements. Still, the mode works well and it’s a pretty entertaining diversion for a short-burst. You’ll be ready to move on from it pretty quickly, however, and are unlikely to go back to it once everything is unlocked. This brings us to Soccer. Which again feels like a game that Kinect Sports could have lived without. It’s so basic and feels more like a poor man’s Subbuteo. You take it in turns with an opposing player to move up the field towards your opponents goal and take a shot. The only thing stopping you from passing are moving NPCs that block the route between the ball and the player you’re trying to pass too. You have to time your shots so the ball is not blocked. When you’re in position in front of the goal, you have to time your kick or header perfectly in order to score. Players can act as a goalkeeper in order to deflect the ball which can often require you to perform full on dives across your living room. Or just reach out very far, putting you out of Kinect’s radius. That’s never happened before…. Unfortunately, despite getting power shots, it really feels like getting a goal in is a bit random and lucky, especially since goalkeeping is pretty straight forward and made easy to deflect. Sadly, Soccer doesn’t work quite as well as you’d hope. This is about as good as the experience can be but it’s ultimately very flat and shallow. Playing it just made me think Rare have wasted another one of their six-game quota and should have included something else. Frankly, between this and Climbing, the Kinect Sports Rivals package has a lot of making up to do with its last two games. And sadly, Bowling just feels wrong. Weirdly, i think I prefer the Wii Sports original to this and even the Kinect Sports original. Rare seem to love the fact that Kinect allows you to open and close your hands, and have turned Bowling into a glorified tech demo using that feature alone. It never feels like you can get your ball in the right position to do precisely what you want. Picking up the ball does feel neat, but the issues lie in your positioning; where you stand in your room and in swerving into the right position. Somehow, someway, Rare have made this more difficult than it should be. Surprisingly, bowling is good for spinning the ball and producing power-strikes. Kinect definitely seems to register your twisting motions and your attempts at technique, which is highly commendable as that is an area motion-controlled bowling games have yet to capture. But it feels like the core strands of gameplay have become confused. It is as if Rare have worked so hard trying to redefine the bowling experience, that they forget how to make an easy to drop in, entertaining bowling game. After playing, I had an insatiable urge to pull out the original Kinect Sports and bowl. I even wanted to grab my Wii Remote and go a few frames. That’s not a good sign. Sadly, Tennis is an equally frustrating experience. The room will need to be re-arranged quite extensively and gameplay is far more intense than it needs to be. Rather than swinging your arm in the direction of the incoming ball, Kinect expects you to do a full body-turn and a overly ferocious incoming arm-smash. It’s good in one way, as it will make you ‘work for your supper’, and it gives off a ‘legit-sport-like’ feel, but the game definitely couldn’t be more lenient on the player. 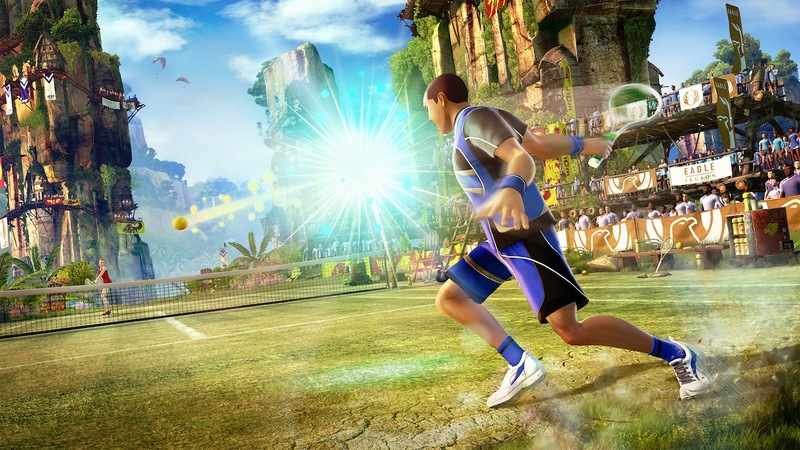 It will take several attempts to get yourself acclimatized to the style of play Rivals expects from you, and once you’ve mastered the strokes, you’ll be able to perform top spins and back-hands pretty effectively, even though you’ll miss at least 50% of your return shots because Kinect fails to recognise them. But as you might expect, this isn’t a game that lends itself well to multiple people playing side by side in the same room. The amount of force you need to put into your shots means you’re probably going to smash your friend, family member or partner pretty hard and do some damage. The sad part is, Rare have put a lot of effort into the look of the game, given it a compelling soundtrack and done a lot of work around giving the modes more depth and substance by adding ranks, experience points, coins and leagues. 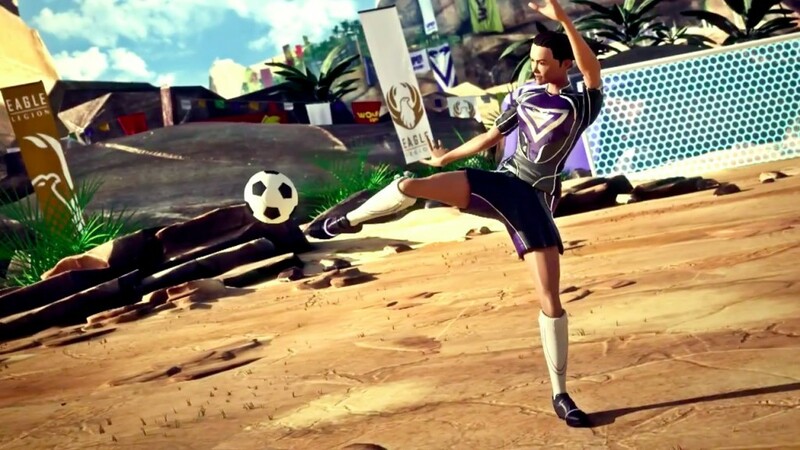 Microsoft and Rare clearly look to Kinect Sports Rivals as the game that will finally prove Kinect is essential to Xbox One and will change everyone’s perceptions of the tech. But quite honestly, it actually makes the device feel more superfluous than ever. It’s looking for so many specific motions in your body, that it seems to ignore the general broad-strokes the body makes in order to interact with a game. 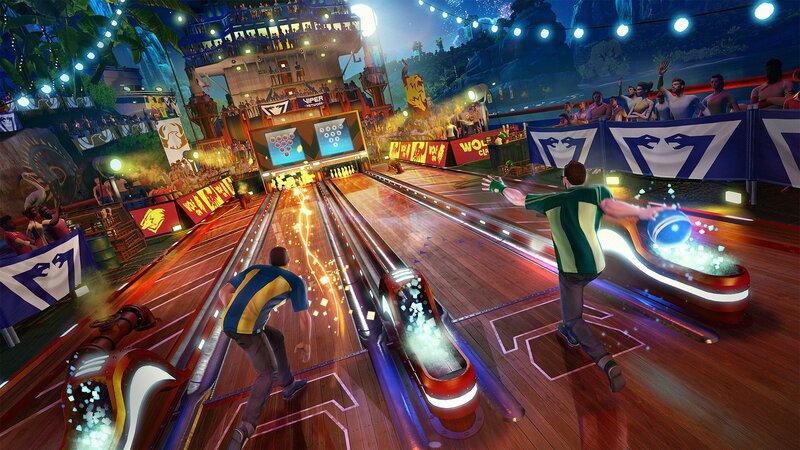 To credit Rare, the Kinect Sports Rivals Hub is a genius piece of design. It allows constant competition with your friends and creates a ghost in the Xbox One cloud that can constantly challenge your friends even when you’re not in the game. Collecting coins also allows you to continually buy new vehicles which offer unique abilities in the game modes, as well as attire to change the look of your character. There is fun to be had here, but unfortunately a lot of that is marred with frustration. Kinect needs to focus on broad, body strokes and less on specific finger gestures, heart-rate and other aspects of the body. Rooms need to be altered way too much in order to get any sort of interaction and/or enjoyment from the games. The irony of Kinect Sports Rivals is that the majority of the game’s problems come from using Kinect. The graphics are gorgeous with only one or two break-ups, the soundtrack is great and the online features work wonderfully. Even the story is moderately entertaining. But the core games are a mess. It is a struggle to interact with Kinect at a base level on some games, and others are overly demanding. The perfect living room that these games are designed in will only be suitable for a small number of gamers, cancelling out the majority of the market. Unfortunately, Kinect Sports Rivals proves our worst fears: gaming with Kinect is still best-suited for voice control, basic menu gestures and fitness games. Rare have not created a showcase title for the tech, they’ve actually exploited serious holes in its competency, sure to raise serious questions about the future of the device being bundled with Xbox One. We hope future patches can change all of that.